Butler Snow Advisory Services, LLC (BSA), a leading strategic consulting and transaction advisory company based in the Greater Jackson area – has named Wesley Roberts to their team of professionals. 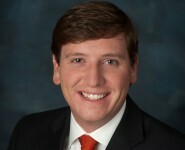 Most recently, Roberts served as a manager in the transaction advisory services department of Ernst & Young, LLP in Nashville, Tenn., where he managed and participated in financial due diligence engagements, particularly related to acquisitions by private equity investor groups and strategic corporate buyers. In his role at Butler Snow Advisory, Roberts will focus on transaction advisory services, which include capital formation, buy-side and sell-side representation, mergers and acquisitions. Roberts holds a bachelor of business administration and a master of accountancy from the University of Tennessee. He is also a certified public accountant, licensed in the state of Tennessee.